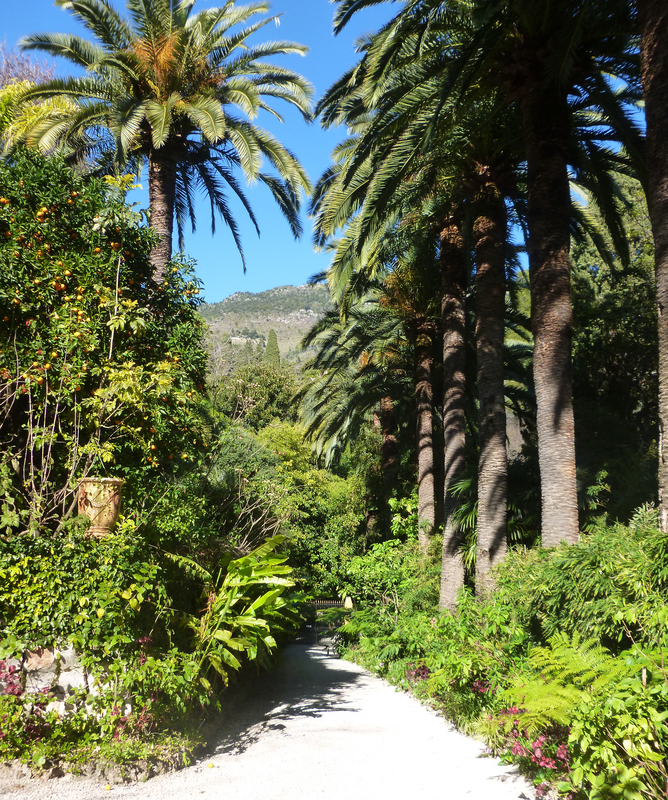 Phoenix canariensis line the path up to Villa Val Rahmeh. 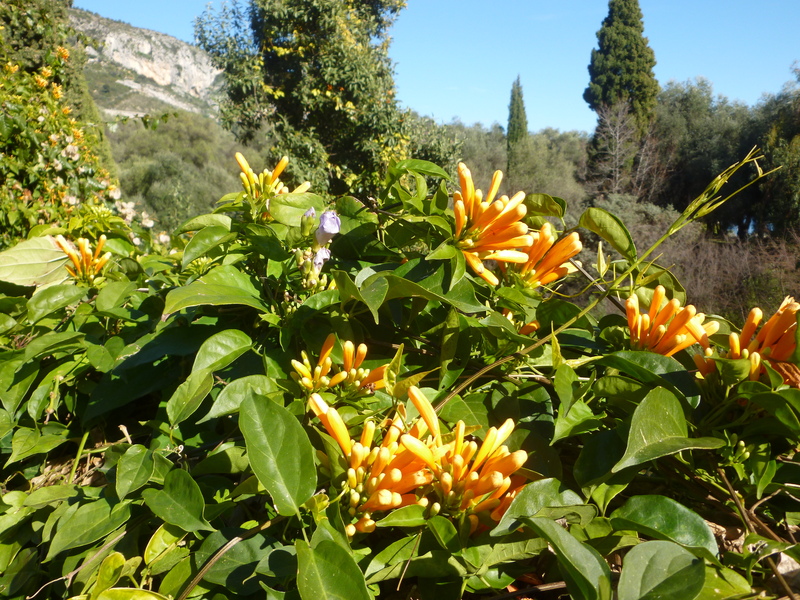 Last week I was exploring gardens along the stretch of the Côte d’Azur between Saint Jean Cap Ferrat and the Italian border. From the 1880’s up until the First World War, wealthy British and American families overwintered here, often for their health. 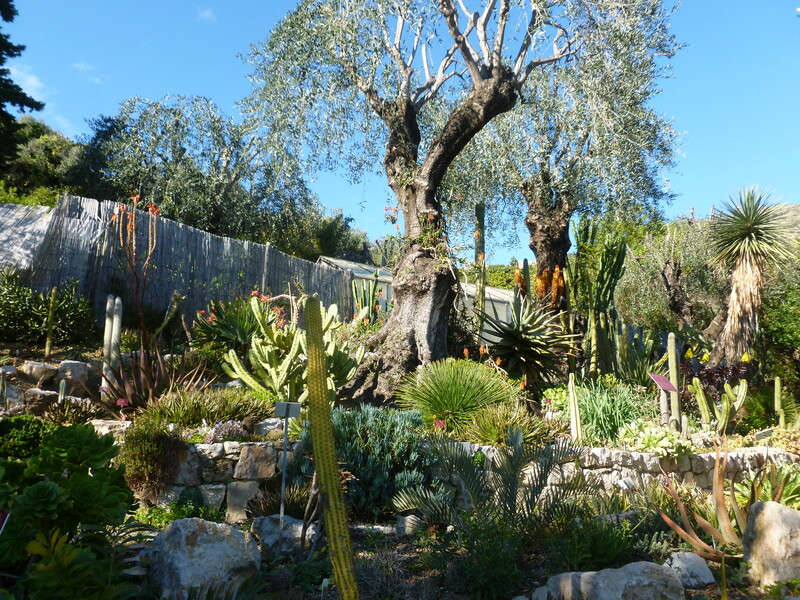 Protected by the Alpes Maritimes to the north, with south-facing slopes and humidity from the Mediterranean sea, the climate of this area was found to be perfect for growing and acclimatising exotic tropical plants recently discovered by plant hunters in Africa, Australia and the Americas. Some of the gardens created by these wealthy families still exist, often by a miracle, having survived long periods of neglect, two world wars and the threat of development. 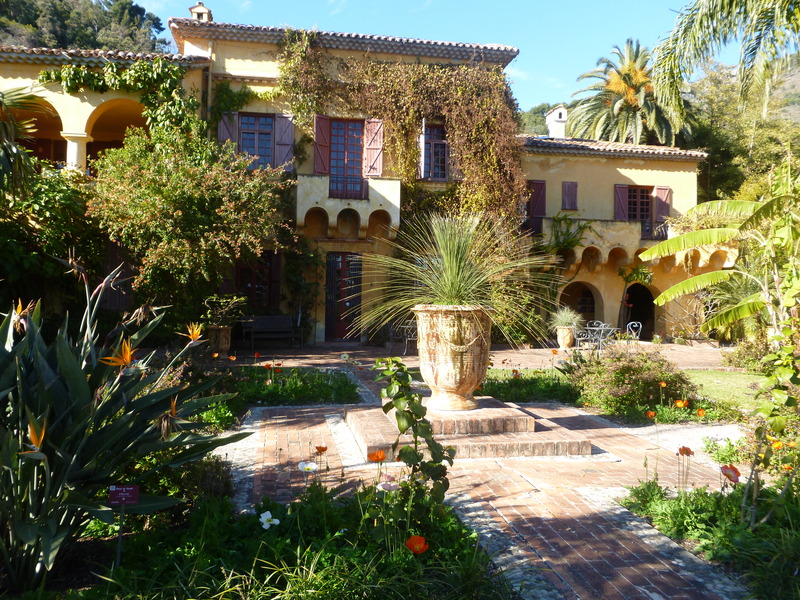 The first garden I visited was Villa Val Rahmeh in Menton. This villa was bought in 1905 by Lord Radcliffe and his wife Rahmeh, who added to the house and bought neighbouring olive terraces to extend the garden. 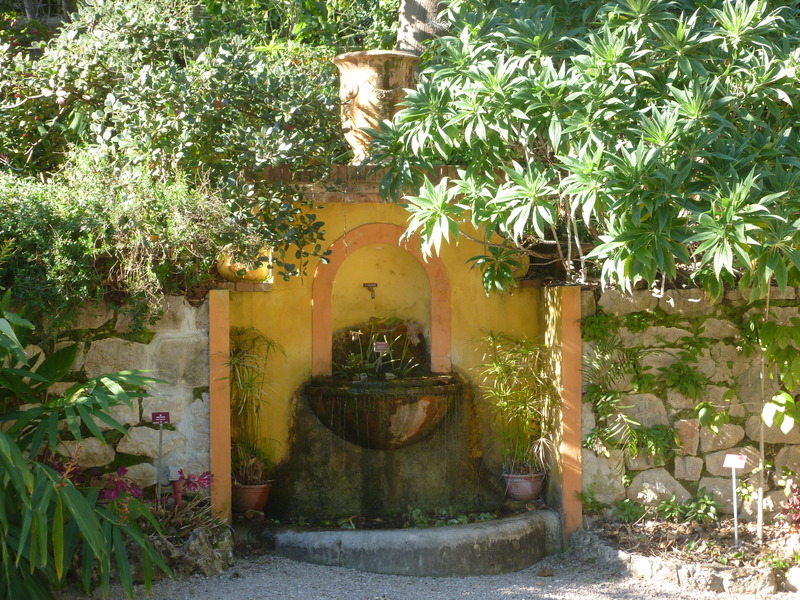 The villa was then sold in 1957 to Maybud Campbell, a passionate plantswoman who added more land and added an ornamental pool for growing exotic waterlilies. In order to save the gardens from developers she sold the property in 1966, for less than the real value, to the Ministry of Education and they are now maintained as a botanical garden by the French Natural History Museum. 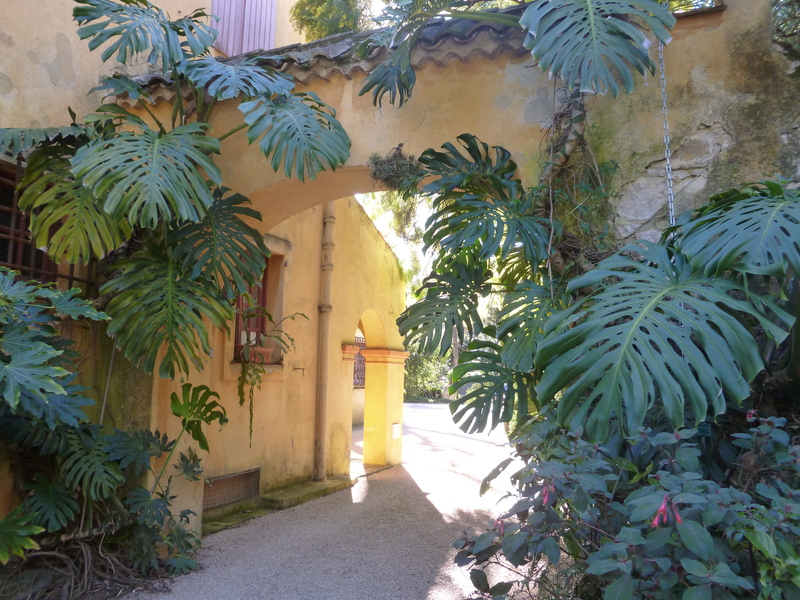 To the side of the house the cheese plant, Monstera deliciosa, climbs over an archway. 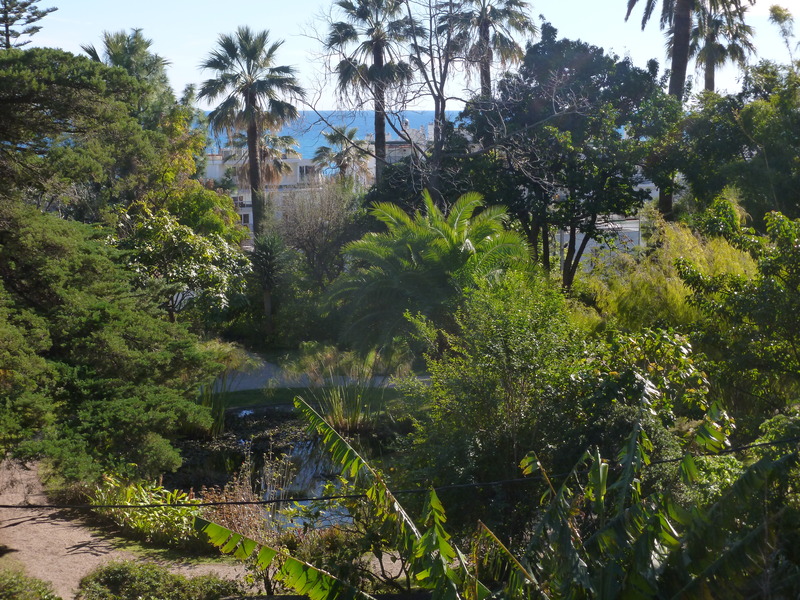 The terrace of the house has a beautiful view of the sea and in winter is a welcome sun trap. 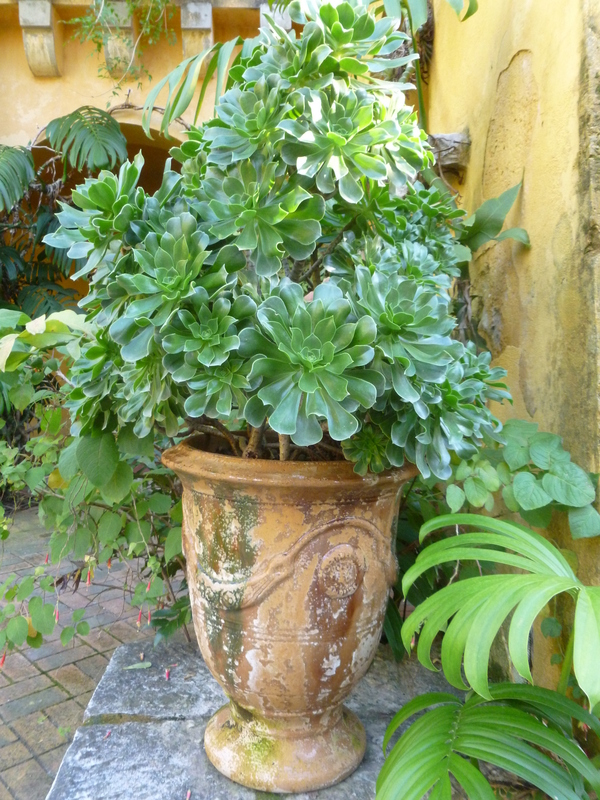 Brick paths centre on this beautiful urn made at one of the famous potteries at Anduze. The beds around the paths sparkle with strelizias and Papaver nudicaule (Iceland poppy) all in flower at the end of February. To one side of the terrace a floriferous Pyrostegia venusta drapes itself over this wall, climbs into adjacent trees and cascades down the huge retaining wall on the other side. Pyrostegia is in the Bignoniaceae family and is related to the hardier campsis species that grow in the south of England. Many of the gardens here were designed to be at their most beautiful during the winter when their owners were in residence. 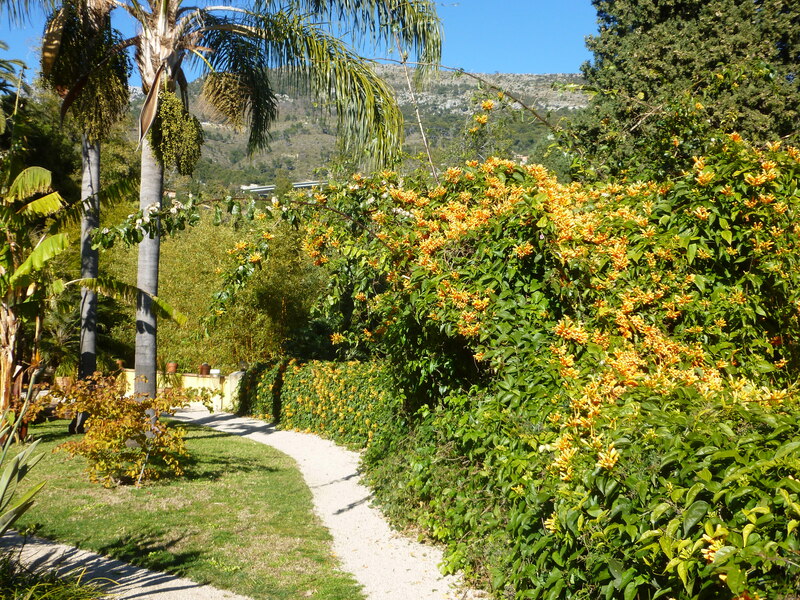 However the gardens are also at their best in spring and autumn because many Mediterranean and subtropical plants are dormant during the hot summer season. When it came up for sale, Maybud Campbell bought the land on the other side of the sunken mule track at the bottom of her garden, thus protecting her sea view. Here she created a pond which is planted with papyrus, lotus and giant water-lilies. There had previously been a tennis court on this spot and when the gardeners dug out the pond, they found a burial casket containing lots of tennis balls and the bones of the little dog who obviously loved to fetch them. 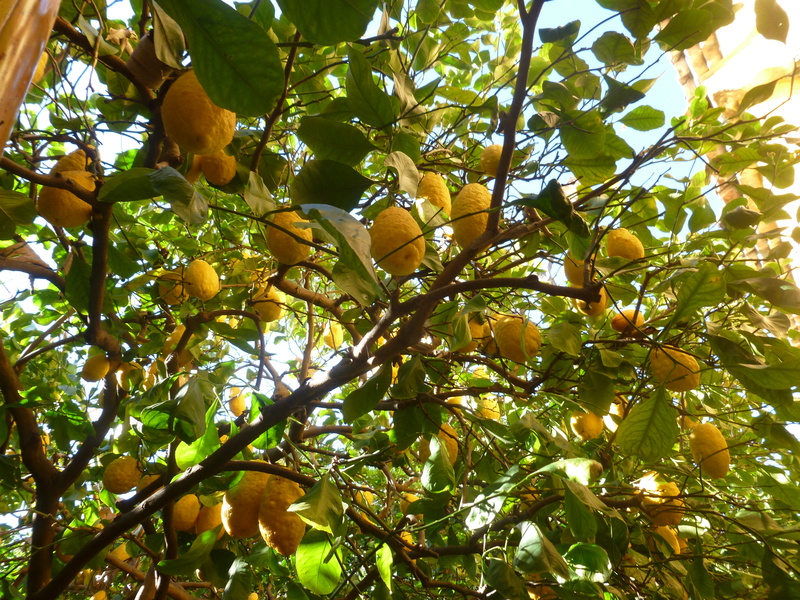 The garden has a big section dedicated to citrus trees including the famous Menton lemon, oranges, kumquat and grapefruit as well as the buddha’s hand lemon with its witchy ‘fingers’. This beautifully cloud pruned hedge was created in the 1950’s by Maybud Campbell’s gardener Antonio. He smoked clay pipes, and broken pieces still turn up regularly in the hedge and borders. 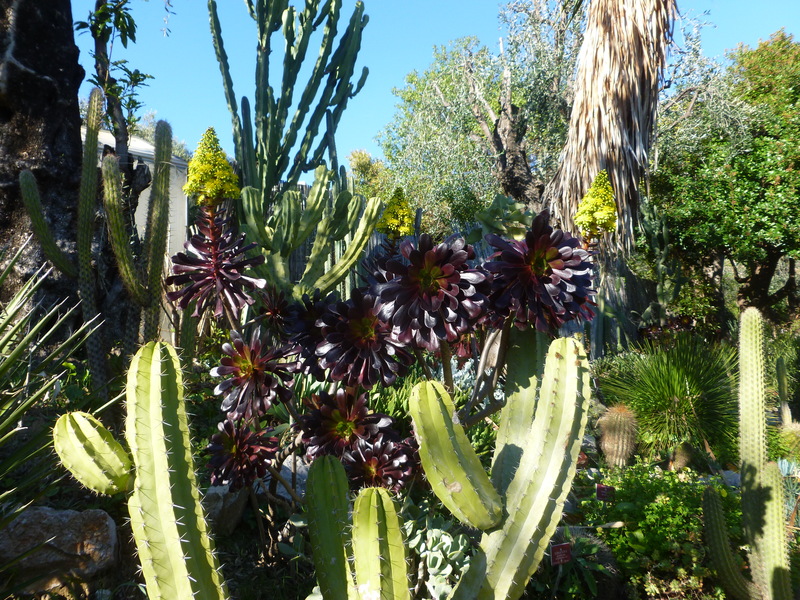 To the north of the house lies the cactus and succulent section of the garden. Terraces previously used for growing olives are now host to cacti, aeoniums, euphorbia, agaves, aloes and other succulents. 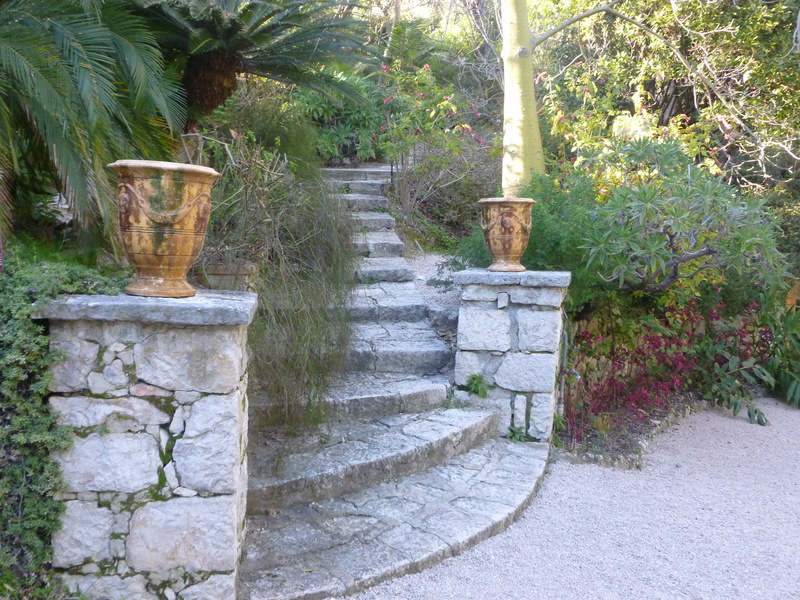 Two more Anduze vases flank the steps and path leading to the fountain and the tropical forest section of the garden. This collection includes the gigantic tropical bamboo Dendrocalamus asper which can grow by 30cm a day. Crossing over the bridge into the pond garden, the foliage of a very fine leafed bamboo, possibly Otatea acuminata complements the palms of a venerable cycas. The beautiful gold and green striped culms of Bambusa vulgaris var. vittata. 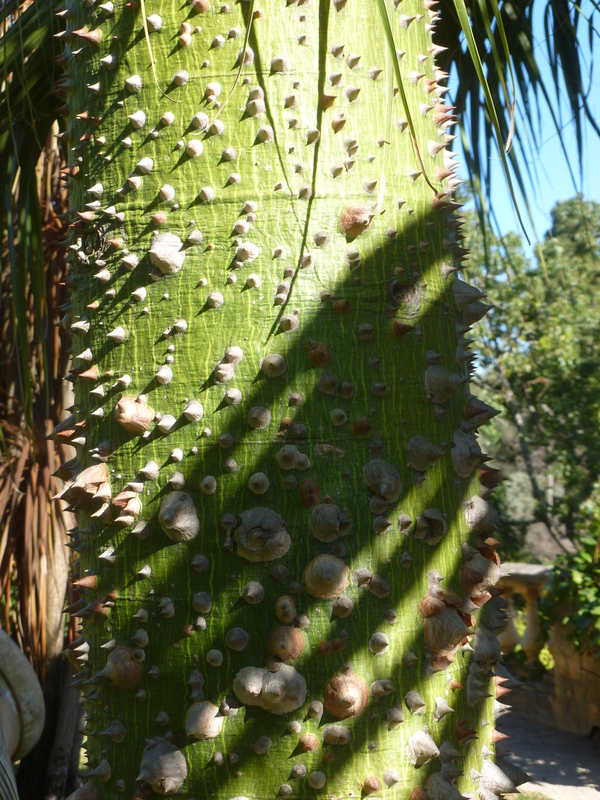 The spines on the trunk of the Chorisia speciosa or false kapok tree would deter even the most ambitious climbing predator. 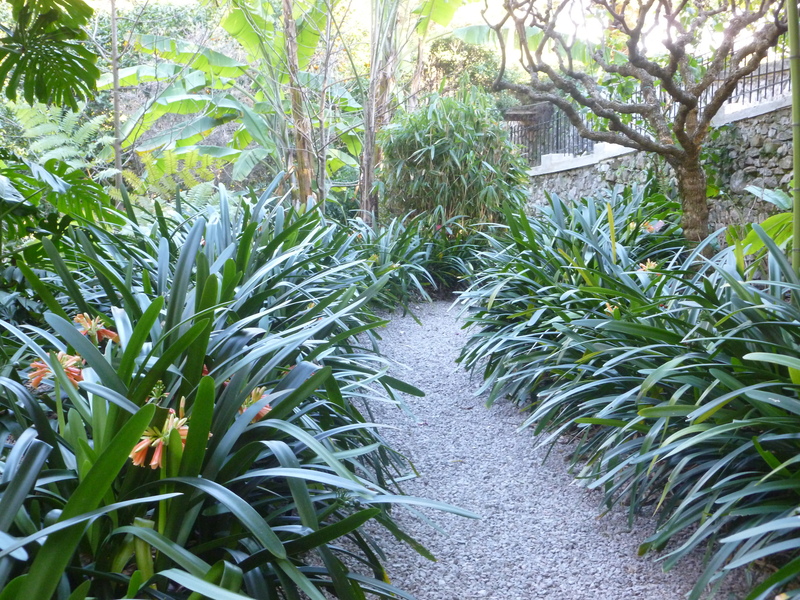 Descending to the lowest part of the garden, orange-flowered clivias line the path. 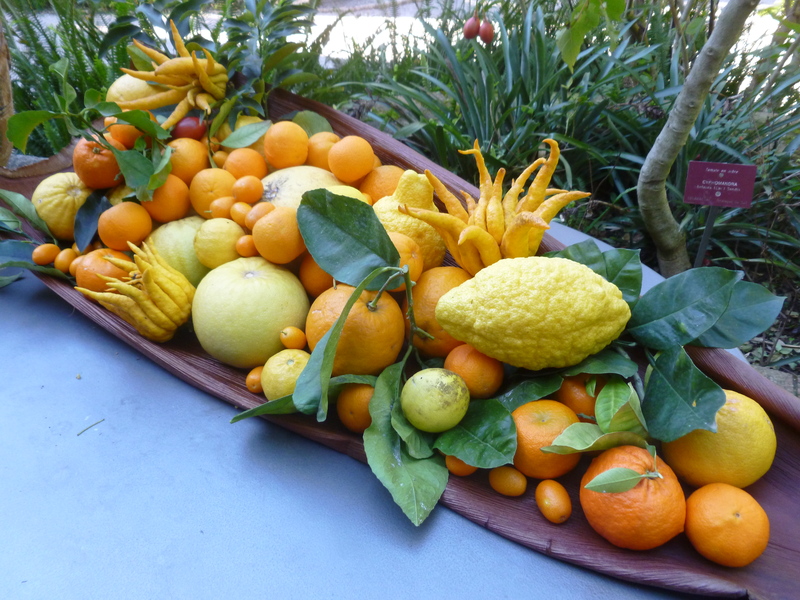 On a huge dried leaf, a display of citrus fruits from the garden. Selling the property to the French government certainly saved Val Rahmeh for our enjoyment today and it now has a clear purpose as a scientific botanic garden and plant museum. Botanists here are currently involved in a project to save the Sophora toromiro, a tree native to the Easter Islands, which is now almost extinct there. Several plants have been raised from seed and these young trees have now been planted out in the garden. The eventual aim is to be able to propagate more plants and to return them to the Easter Islands. Telephone : 04 93 35 86 72, English is spoken. Open every day of the week except Tuesdays, hours vary with the seasons. Closed the 25th December and the 1st May. Menton is a lovely place to visit with a picturesque old town clinging to the mountain down to the sea. We were there for the Lemon Festival which takes place in February-March and features huge sculptures made of citrus fruits and a carnival parade. 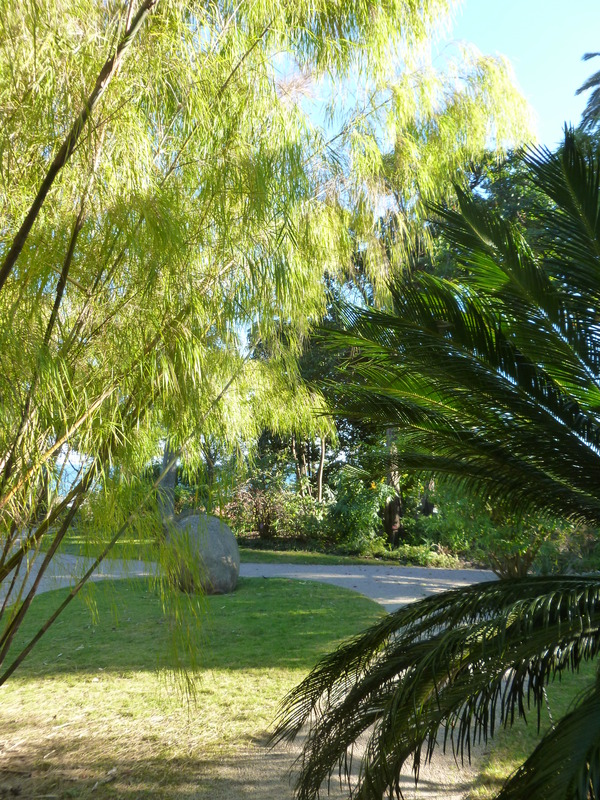 Also interesting to visit is the new Jean Cocteau museum designed by architect Rudy Ricciotti, the cabanons of Le Corbusier and Eileen Gray on Cap Martin and of course the other beautiful gardens in the area..of which more to follow soon. 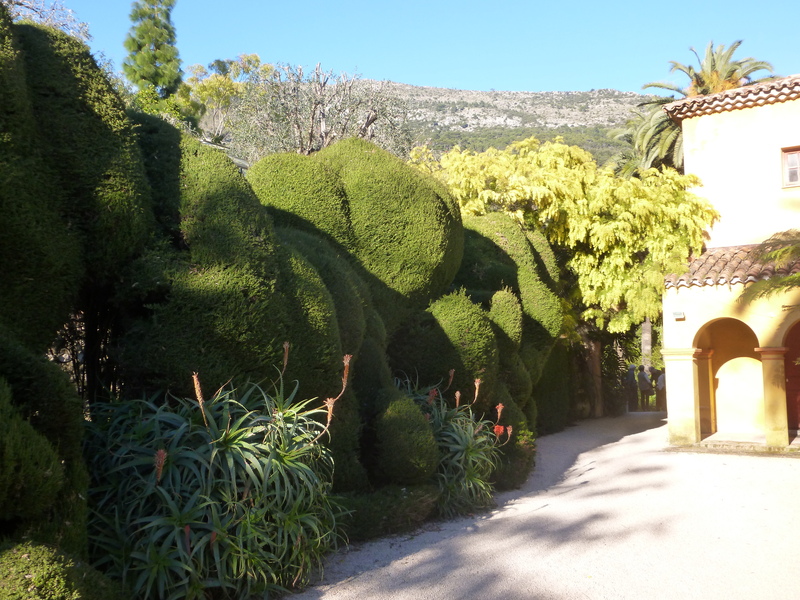 I visited the gardens whilst assisting Susan Worner on her tour featuring gardens around Menton in late February to early March 2015. For more information go to Susan Worner Tours. Thank you for letting us know about this beautiful garden. It seems a shame that few of the fabulously wealthy today choose to make gardens, though I know there are exceptions. Thanks for your comment. I guess the difference was that in those days, collecting new plants was a real privilege and owning a rare new specimen brought status. That light, so beautiful. A vision of paradise. Have visited the wonderful Cap Roig on the Costa Brava a couple of times and it has a similar history. Thanks. And I love that name. Maybud. Great isn’t it! Perfect for a gardener.